Paper wasps have a pinched waist and long, thin legs that hang down below their body as they fly. 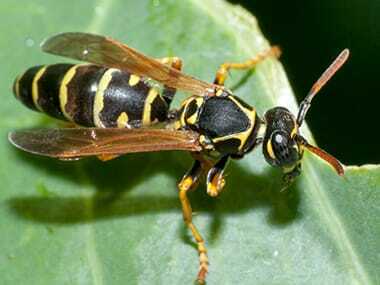 Paper wasp have gray wings and bodies that are black or brown with yellow and/or orange markings. Adults grow to between 1/2 and 1 inch in length. Paper wasps have a smooth stinger; and while they are not particularly aggressive, they will sting in order to defend themselves or their colony. Where are paper wasps found? Paper wasps build their nests off the ground; they are commonly found hanging from trees, shrubs, porches, decks, roof soffits, and door frames. They are referred to as ‘paper wasps’ because of the paper-like material that they create to make their tan, umbrella shaped nests from. The paper wasps make their nests from a mixture of chewed wood and their saliva, attaching each honeycomb shaped cell to the next until the nest is complete. The diet of the paper wasp makes them an environmentally important insect. Paper wasps are predatory insects with adults and larvae feeding on a wide variety of nuisance insects and spiders, helping to keep those populations down. Adults also feed on nectar and pollen which aids in the pollination of a variety of crops, trees, and plants. Preventing paper wasps from choosing your property to feed and nest on is almost an impossible task; but luckily, there are several things that you can do to help make them want to choose someplace else to live. Place tight fitting lids on outdoor trash cans. Place tight fitting caps on all chimneys. Repair holes along roof lines. Make sure that all windows and doors have intact screens placed in them and that gaps found around doors and windows are caulked. If you’ve found a paper wasp in a nest that could prove harmful to people or property, please contact Quik-Kill Pest Eliminators. We’ll discuss your situation and treatment options that will eliminate the threat without injury to you or your family.